Can Lenovo hit the perfect balance between versatility, portability and price? The Lenovo G505 is potentially good value, if you're prepared to upgrade the memory the moment you buy it, but ultimately it doesn't quite shine enough to make us want to recommend it. How much should a laptop cost? A laptop that can handle serious applications, surf like the best of them and also turn its hand to the odd game? How does £350 strike you? 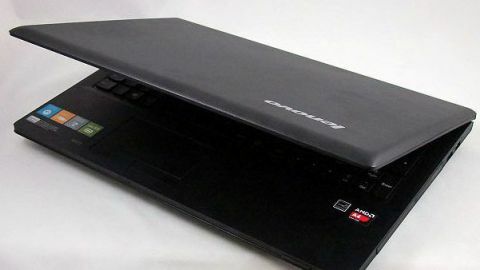 That's the price tag that can be found hanging from Lenovo's latest offering, the potentially bargainous Lenovo G505. With the world and his dog jumping aboard on the Ultrabook bandwagon, it's good to see that there's still interest from system builders to manufacture value-focused machines. Laptops such as the recently released Samsung ATIV Book 9 Lite and the Toshiba Satellite C50 prove that the market is healthy, despite the likes of the Apple iPad and Nexus 7 threatening to muscle in on the action. The mention of tablets does highlight the potential problem with any affordable laptop though, and that's whether you actually need a laptop - or will a tablet do the job in a more portable form factor with better battery life? The truth is, that while it's easy to dismiss tablets for content creation, if you simply want to surf and perform a few tasks while sat on the sofa or on a train, then a tablet can be hard to beat. One area where budget laptops still definitely deliver though is when it comes to actually working, and by that we don't just mean rudimentary emails and maybe a little tweaking of existing documents and websites. We're talking document writing, photo and video editing, not to mention website creation, simple programming and a host other of tasks. While you can find ways to do many of these on tablets, you'll often find yourself bumping up against the limitations of the hardware or the limited software. Not so with a full laptop. But what specifications are important for such a machine? If you're looking to work on a laptop, then screen resolution is one of the key factors. We're currently transitioning towards higher resolution screens, although at the budget end of the market you can't expect too much on this front. Not only are the panels more expensive, but the graphical power needed to drive them is notably more exacting as well. You're looking at 1366 x 768 as the bare minimum here, although the higher the resolution the better, really. When it comes to the graphics subsystem, the good news is that the integrated offerings from both AMD and Intel are more than capable of handling most normal tasks, and may even be able to handle the odd game if you're lucky. Likewise the processing capabilities of the latest chips is commendable, although if you're looking to use the machine for video editing, then the more power you can lay your hands on the better.